I’ve been using the health features of the Apple watch a lot recently but today is the first time it has stopped me from doing a specific exercise. I was planning on going for a swim but obviously I don’t want to do that with my watch on. I assumed I’d be able to either enter the workout directly into the Health app (or use a 3rd party app to add the data to HealthKit) and that would then count as part of my 30 minutes of exercise on the Apple Watch; unfortunately this is not the case. I’ve tried with manual data entry and 3rd party apps1 but there is no way for workout data not created on the Apple Watch to be used as part of your Activity… yet. On checking the WWDC keynote, Kevin Lynch mentions that this feature is coming as part of watchOS 2. Specifically he says that “workouts with these [native on the Apple Watch] apps will count” - I’m assuming that any app that uses HealthKit will actually count but we’ll see. I’m not going to install a potentially buggy watchOS 2 on my Apple Watch one week before Apple Pay comes to the UK! I’ve just committed a very simple NSDate extension that gives you a human readable version of the time difference between the date and now (i.e. “2 hours ago”, “just now”, or “last week”). I needed this functionality in a project I’m currently working on but existing solutions I found were all Objective-C and fairly complex. I try not to add any complex 3rd party dependencies when I don’t have to (especially as I don’t want an Objective-C bridging header) so I built this in a few minutes to give me the basic functionality I required. You can check it out on GitHub. In many ways, this sums up how I feel about some development today. Many developers will either embed a 3rd party solution without thinking about it (giving you licensing and support issues in the future) or they’ll spend hours crafting the perfect solution that will give you to-the-second precision with unit tests and a whole host of other stuff you probably don’t need1. Sometimes you just need the simplest thing that works so you can move onto more important things. I love my Xbox One but the one big issue I have with it is loading times. This is mainly due to the spinning hard drive1 inside and the huge amount of data it is expected to push for some of the bigger open world games like GTA V or The Witcher 3. In an effort to speed this up (and because the 500GB hard drive is almost full), I’ve upgraded my Xbox One with an external SSD2. An mSATA SSD that is at least 256GB in size. 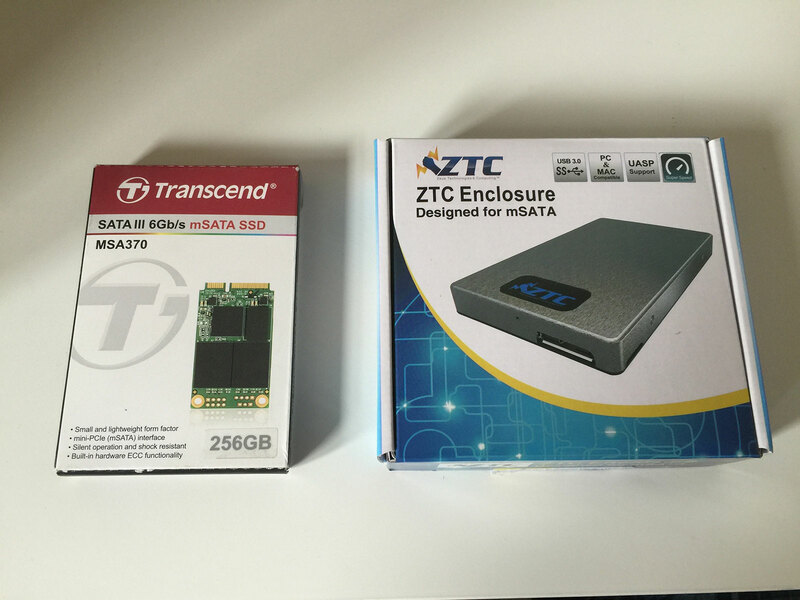 I went for a 256GB model from Transcend. 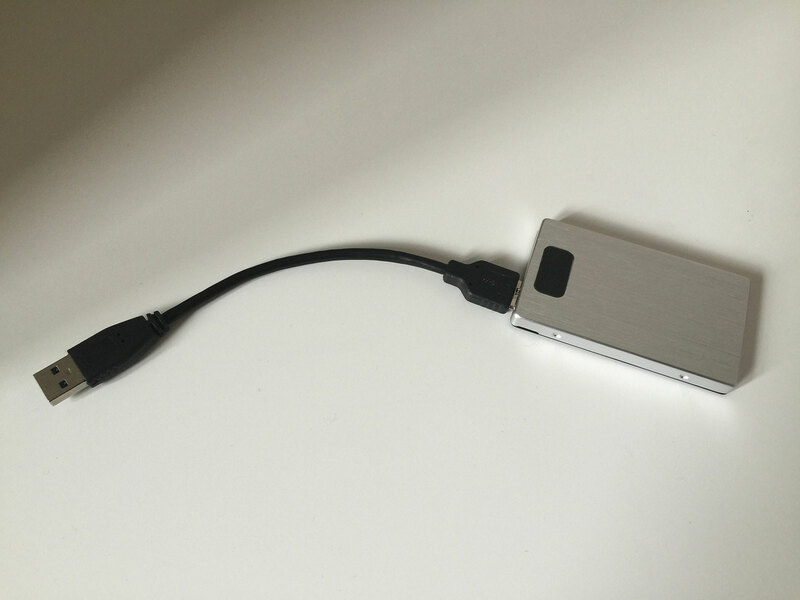 A USB 3.0 enclosure for the SSD. You’ll want one that has UASP support like this one from ZTC. Do not get one from Sabrent3! As soon as you turn the Xbox One on, you’ll be alerted that a new media device has been attached and given the option to format it for games and give it a name. When you have done this, you’ll be able to copy games and apps by going to their individual storage settings and choosing the move option. SSD produces a 60% reduction in loading time. The first test was from a cold start to the opening menu. SSD produces a 30% reduction in loading time (although that seemed to be as quick as it could go due to the logos and publisher videos at startup). The second test was from resuming a game from the main menu. SSD produces a 57% reduction in loading time. For this test, I timed from the loading of the last save point on the main menu. It looks like LEGO Jurassic World’s loading sequence is limited to 37 seconds in order to show 3 pieces of dinosaur trivia at 12 seconds each. Playing through the game though, the time it takes to start a story and fast travel to new locations seems much faster. Overall, it seems that the SSD offers around a 55-60% reduction in speed unless there is something specifically limiting the load time (i.e. videos or placeholder content). I’m planning on just using the external drive for single player games at the moment as there isn’t much benefit in loading the Titanfall or Halo online textures any quicker when the limiting factor is the broadband connection along with everyone else. For me, the SSD option is definitely worth the cost for the big open world games that have a heavy loading time penalty when you die (looking at you GTA V) - it has also increased my overall storage space by 50% which is useful when some games are in the 100s of GB. An iPad app I worked on a little while ago has recently gone live at a popup store in Changhi Airport: Glenfiddich Residence. This was a little different to the work I usually do as it isn’t for distribution on the App Store or ad hoc for enterprise but for a single iPad locked in a display stand. The app is part of a large installation to showcase a limited edition of Glenfiddich which is available exclusively at Changhi Airport. The single cask1 that has been selected by Glenfiddich is on display within a specially constructed glass chamber that showcases the weather and atmospheric conditions of the distillery in Dufftown, Scotland. The iPad app allows for customers to see the current conditions in Dufftown including temperature, wind speed and direction, weather conditions, and the local time. This is paired with multiple sound effects which match with the weather conditions2. The app also talks with a control PC via a direct socket connection over WiFi in order to control the weather effects within the chamber simulating morning fog, wind, and even rain! There is a continuous slideshow of images from around the distillery and nearly everything is animated to entice customers to interact with it. All conditions are in realtime from a weather station near the distillery. 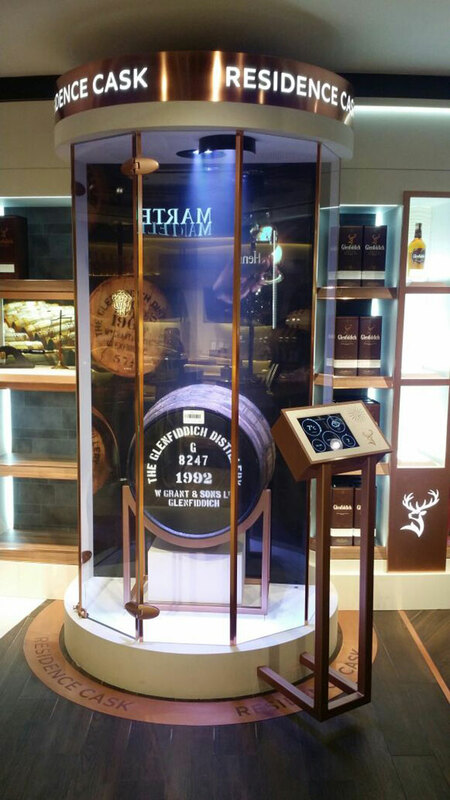 The final aspect is the “start movie” button which reduces the weather effects and begins playback of a video from the Glenfiddich Malt Master on a 1080p portrait screen inside the glass chamber. This video gives an overview of the distillery and details on the bottles from the limited edition cask that are available at the store. The app is written entirely in Swift 1.2 and the iPad is locked down with Guided Access to prevent customers accessing anything else. 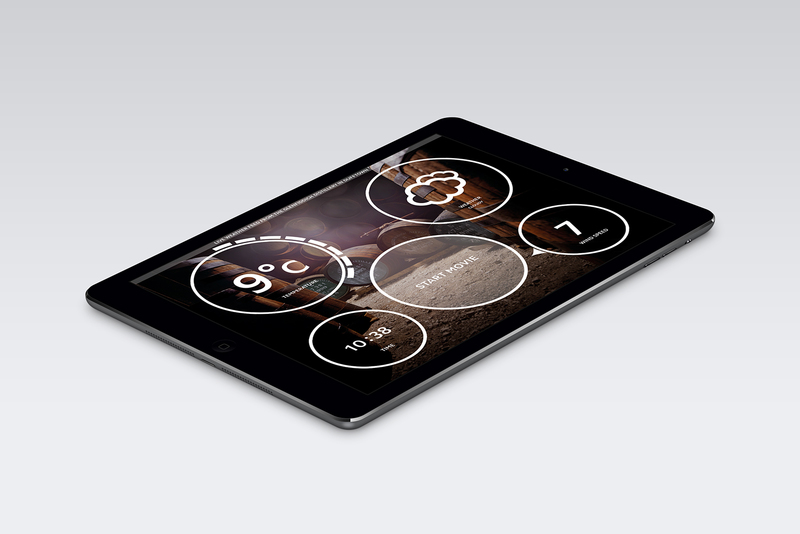 This was a really exciting project to work on as it is very different to the usual iOS apps I do. If you’re visiting Changhi Airport or passing through, be sure to visit the Glenfiddich Residence; I believe it will be there for the next year. In an effort to get fitter, I’ve been using the two exercise apps available on the Apple Watch; Workout and Activity. It seemed strange to me that they were separate apps (which also feed into the Activity and Health apps on the iPhone) but after a bit of time with them I’m starting to understand the distinction. The Apple Watch tries to get you active by introducing you to the three activity circles; Move, Exercise, and Stand. Move: This is basically active calories and is a measurement of how much movement you’ve done. Your goal is based on height and weight but mine started off at 410 calories. Exercise: I’m not 100% sure on how this is calculated but it seems to be doing anything that gets your heart rate up. The goal is 30 minutes per day. Stand: This is designed to make you stand up for at least 1 minute every hour. If you get to 50 minutes past the hour and you haven’t stood up, you get a little reminder. The goal is 12 instances of standing for 1 minute per hour (so standing up for 12 minutes in a row won’t complete the circle - has to be at least 1 minute for 12 hours). 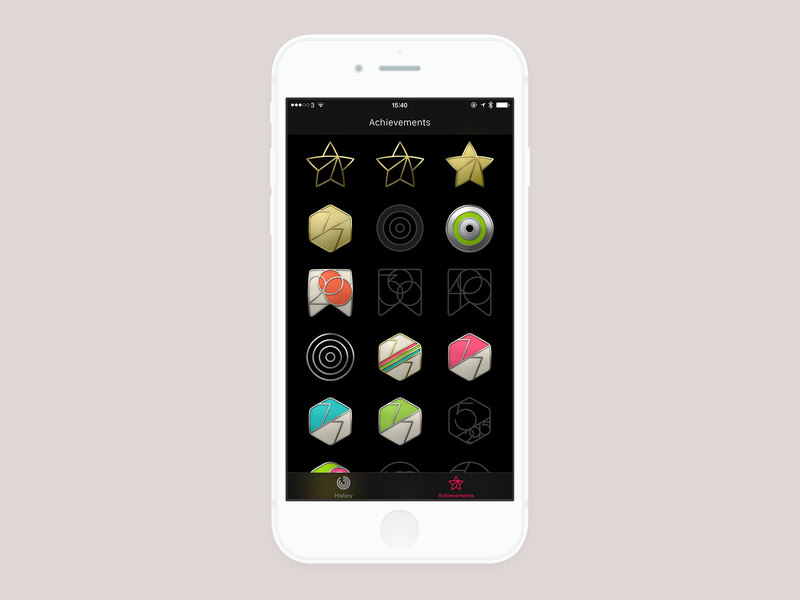 Along with the goals, there are also awards to motivate you to complete your circles each day. These look really nice1 and they use a decent curve so you start off getting quite a lot of achievements in order to make you persist with it. I’ve got most of them now so the next major ones are more tricky ones like “reach your move goal 100 times” or “complete your circles for every day of a month”. 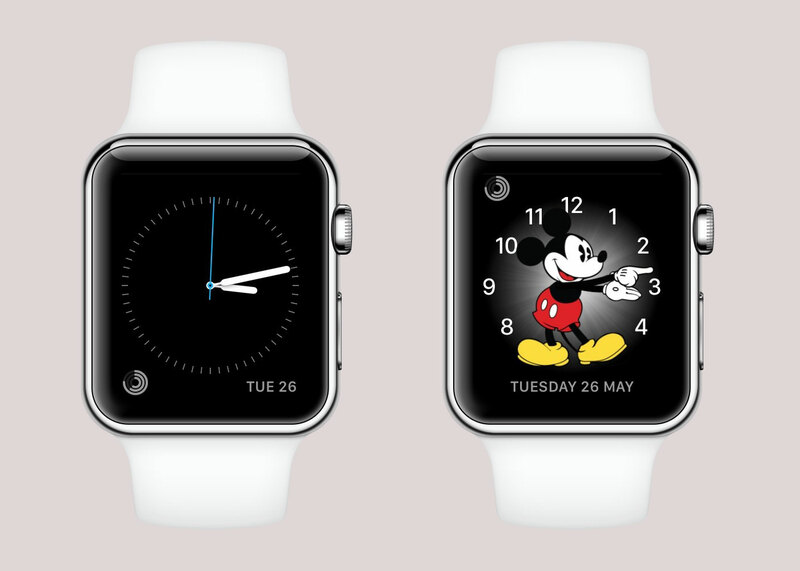 The nice thing about the circular design they’ve gone for is that it fits nicely as a complication on the watch face. I alternate between two watch faces — Simple in the week, Mickey at the weekends — and Activity is the only complication I have active (aside from the date). It highlights the best use of a complication in that I can quickly glance at my watch without touching it and see how far I am for each of my goals; if I want to see specifics, I can tap the complication to go into the Activity app proper. I used to use a FitBit2 but the problem with those is that you either had to use the iPhone app to see how far you’d got or tap multiple times to go through the different views (steps, distance, calories, etc). With the Apple Watch, I can see the 3 important things without getting my phone out and that is a big advantage in my opinion3. It is very motivating as you can see how close you are to completing a circle throughout the day. I tweeted about this over the weekend but one of the most motivating things for me has been the “Avg Heart Rate” on the above screen. Each day over the past week, that number has decreased with the same 15 minute workout which shows (I think) an improvement in my overall fitness. 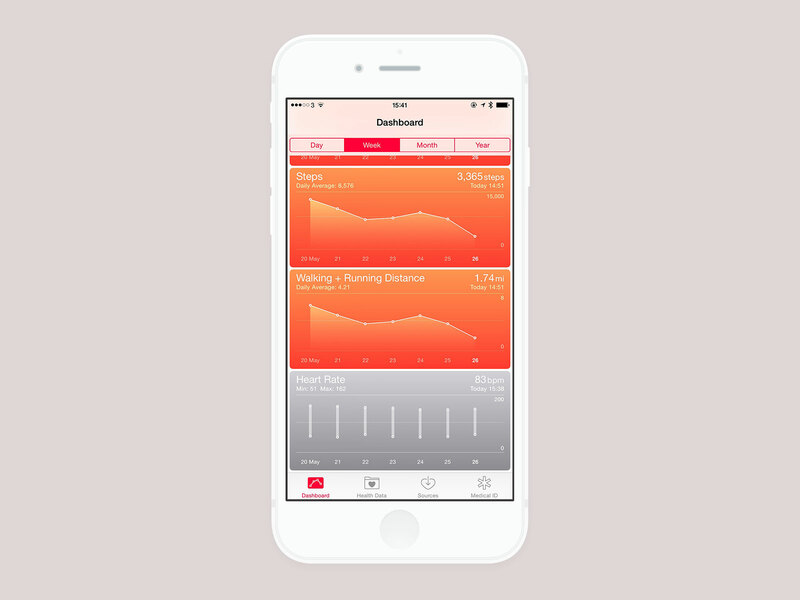 The final part of the fitness puzzle is the Health app on the iPhone. This came as part of iOS 8 and is a way for you to store all of your health data securely. There are loads of apps which can read and write to this store and the Apple Watch is no exception. By default, it will populate the Flights Climbed, Steps, Walking + Running Distance, Active Calories, Workouts, and Heart Rate sections. 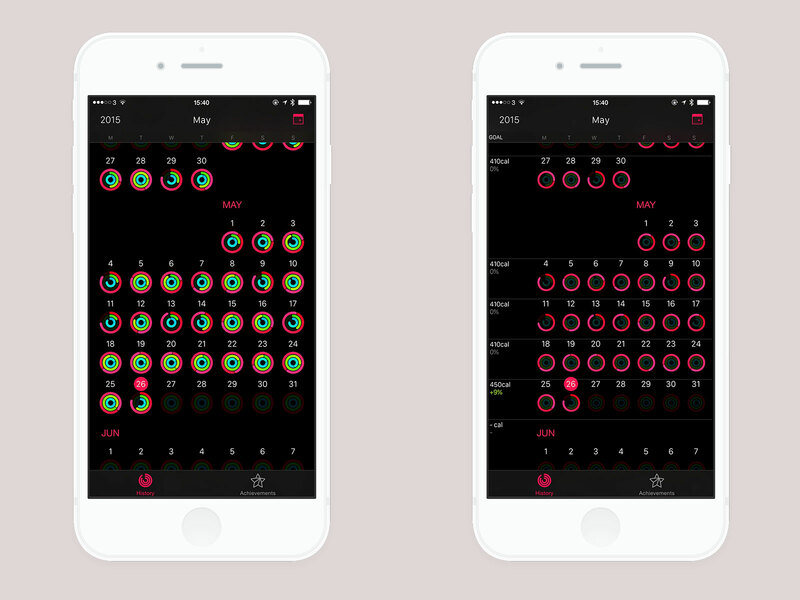 You can choose to display each of these as graphs within the app although I’m hoping for more control over this in future versions as you can’t view specific dates, only “Today”, “Week”, “Month”, and “Year”. This is one of those areas where the continuous heart rate monitoring is really nice as you can get an overall picture of how much you are fluctuating throughout the day - whilst there are plenty of heart rate monitors available on the market, one you don’t have to think about that is constantly monitoring will always win out (and it is incredibly accurate). In conclusion, I’ve found the Apple Watch to be a much better fitness companion than I expected. My assumption was that it would cater for those that like to do running and cycling but wouldn’t do much for the more casual exerciser. In actual fact, it has made me more aware of how little movement I was doing and also helped motivate me more to do things as simple as standing every hour. The majority of its features can be done on other devices, such as the FitBit, but the tight integration is key. The heart rate monitoring showing up in the Health app satisfies the stats nerd part of me whilst the simplicity of 3 goals per day has definitely made me more likely to succeed as I don’t want to break the streak I’m on. If you’ve got the Apple Watch and haven’t explored the exercise parts, I’d definitely recommend giving it a go; once you’ve done it for a day or two, you’ll find it very hard to stop! When I launched Unique Items for WallaBee a few years ago, I didn’t completely grasp how popular they’d be. Within a few weeks, we had hundreds of orders (all processed through PayPal) and ended up with a year-long backlog which has only now been cleared. In anticipation of allowing players to commission these items again, I’ve been looking at payment providers and settled on Stripe now that they’ve fully launched in the UK. After having a quick look at their docs, I realised it was going to be insanely easy to integrate their SDK into a website and that is when I started thinking about using them for In-App Purchases (IAP). The end result so far has been that 50% of our players have chosen to purchase online2 which adds up to a sizeable increase in income as Stripe charge roughly 4-5% once currency conversion (if necessary) is taken into account. Another nice benefit is that Stripe pay you daily for transactions 7 days ago - that means the sales from today will be in our account next week whereas with Apple we have to wait as long as 2 months for a transaction to be paid. We also get more control over the refund process as at the moment anybody can ask Apple for a refund and will usually get it - we don’t get notified when that happens so it means some players can get purchases for free3. It is permissable to sell content for your apps online, you’re just not allowed to have any buttons linking to the site within the app. This means that we’ll need to keep both the Apple IAP system and our Stripe online system running separately but so far the results look good. If you have some form of gaming app that relies on IAP, you’d be crazy not to look at doing something similar. I had an email this morning from a developer who wanted to connect directly to my iTunes Artwork Finder in order to power their own artwork finding app. This seemed like a good time to point out that there is no need to do this1 as I have the source code freely available for everyone on GitHub.